While the focus of this analysis so far has been on marriage and remarriage among individuals, it’s interesting to look at the dynamics of couples, based on whether both members are in their first marriage, or whether one or both have been married previously. 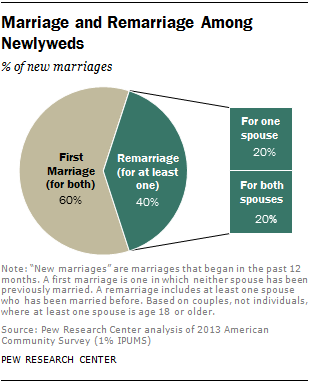 Among new marriages in 2013, fully 40% included at least one person who had been married before. In 20% of these cases, it was a remarriage for just one of the newlyweds, and in the other 20% of new marriages, both partners had been married at least once before. In 13% of these new marriages, at least one person had been married two or more times previously. What proves most striking when comparing the profile of couples in a first marriage versus a remarriage are the age differences of the spouses. Age differences are far more prevalent among remarried couples than among those who are marrying for the first time. At the extremes, there is a 10-year age gap in just 5% of new first-time marriages, while this is the case for 20% of new remarriages. It’s more common for the husband to be older than the wife in both first-time marriages and remarriages. In about one-third (32%) of remarriages, the husband is at least six years older than his wife, and in 16% of remarriages, the husband is at least 10 years older. Just 14% of new first-time marriages involve a husband who is at least six years older than his wife, and just 4% involve cases where the husband is 10 or more years older. 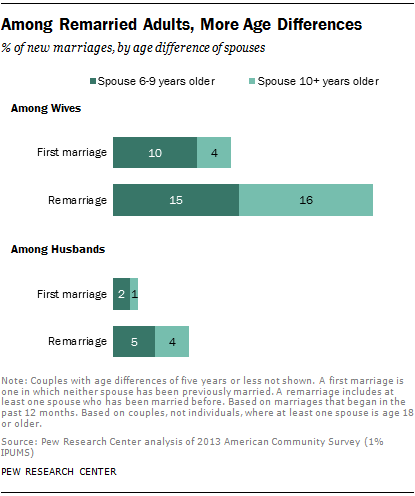 Among newly married first-time couples in 2013, 39% included spouses who were within a year of each other’s ages. Among remarried couples, this share drops to just 21%. It’s far more common for first-time couples to include two adults with college degrees than it is for remarried couples. While about three-in-ten first-time married couples fall into this category, only half as many remarried couples do (29% vs. 13%). The likelihood of the husband having more education than his wife is also lower among first-time couples than among remarried couples (11% vs. 15%).18 Put another way, remarried couples are more likely than those marrying for the first time to include partners with different educational levels (36% vs. 30%, respectively). Chapter 1: Trends in Remarriage in the U.S.